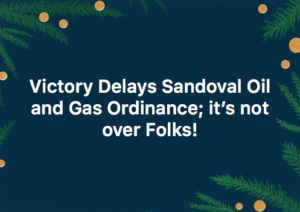 Elaine Cimino Justice nodded her head In the early morning hours Friday, December 15th, when the Sandoval County Commissioners imposed on their constituents a grueling 10-hour meeting where in the end, at 1:30 am, the Sandoval Oil and Gas Ordinance was voted down 4-1. Over 150 battle weary community members who braved attending had to be there, 2-hours prior to meeting in order to get a seat. There were still another 100 people locked out of the Commissions Chambers. While people inside the chambers were allowed to speak, only a few lingered outside were only let in the chamber after 11 pm to have their voice heard. The Commissioner refused to hold this in a public meeting in an appropriate venue will still need to be addressed as we move forward in this process. The County has a pattern and practice of behavior that violates the transparency laws. Special Use Permitting is still in effect with notification for all areas, which is much better than what the “Permit by Rule” streamline ordinance would have given us. Immediately after the vote Commissioner, Eichwald moved to send it back to the PZ Commission. People involved say, not so fast! There are many things left hanging and we still have another year to go on this issue, at least! · NM Tech re-evaluation of the contract and pull the contract that helps the industry locate oil and gas mineral deposits with taxpayer’s money. · Implement a Community notification plan and program for informational and town hall meetings in various communities in the county. 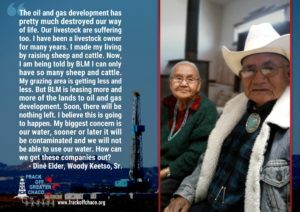 Many Diné (Navajo) elders have seen firsthand the disruption and poisoning that the gas and oil industry has brought to their land. Woody Keetso, Sr. shares a bit of his story about how the BLM has hurt his livelihood and talks of his fears for their water supply. · Allow various rural communities to prepare Community District Overlays Zones for specific for Water and air protections e.g.Exemptions, exceptions or exclusions are the appropriate terms. · A Motion for a temporary moratorium. Be safe this holiday season! I hope to see you in the coming year. Rest now! Relish the delay and the opportunity to redress the process for we have more work to do!